Much can be said about Manchester City, but they were absolute sky-high in the Premier League this season. It only seems fair that the Champions of England gets the first Home Shirt released amongst all the Premier League clubs. Let’s take a closer look at the Sky-blue Manchester City 2018/19 Home Shirt from Nike! The new Manchester City 2018/19 Home Shirt is just as you expected it to be. It’s kept simple, while praising the Sky-blue part of Manchester. The base of the shirt is made in light blue colour, which is seen on so many other previous Manchester City Home Shirts. But to make this one different, Nike has used the Vaporknit design on the shirt. This adds a navy colour to the sleeves, the so-called ‘Midnight Navy’ colour, which is made as a Zigzag pattern. While we are at the sleeves, you will once again spot the Nexen Tire sponsor on the left sleeve, made in a white colour so there isn’t a clash between the sleeve design and logo. The Manchester City 2018/19 Home Shirt will also feature some small extra details, which complements the Home Shirt in its own way. First of all, Nike has added a buttoned collar on the Home Shirt, which the players might enjoy during the warmer days in England. The text #MANCITY is placed on the inside of the collar, making the shirt more modern, if we look at it from a Social Media point of view. Furthermore, ‘CITY’ is writing on the back of the neck, and together with the hashtag it all gives a nice twist to a plain shirt. As per usual Manchester City will play in white Home Shorts and as something new Manchester City will wear dark blue socks. Something that we haven’t seen Manchester City wear since 1990’s. The socks will also have a nice graphical design in light blue which runs across the shin. The dark blue socks give a nice retro look, taking us back to the days when it used to be no-Nonsense football! 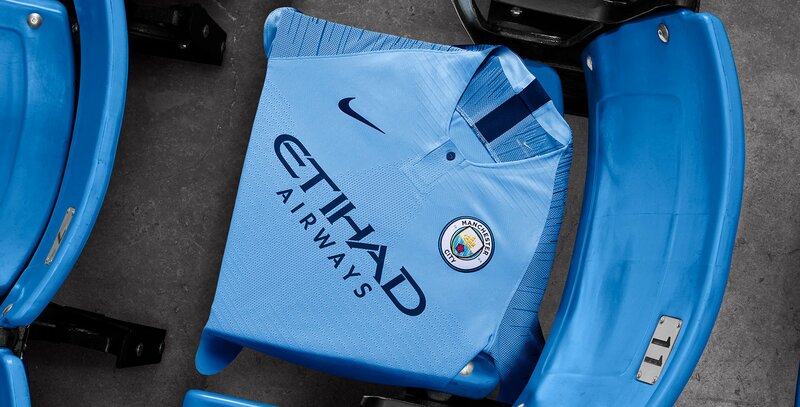 The new Manchester City 2018/19 Home Shirt is made from the popular Vaporknit template, which is already seen on many of the new World Cup kit for the national teams. The Vaporknit template is designed to facilitate speed trough performance and aesthetic. The key elements here it to offer the best possible conditions through breathability, lightweight and speed. Do you also have high hopes for another great season for Manchester City. Then get your 2018/19 Home shirt from the 14th of May and support the blues!